I’ve been posting pictures for the past two posts so I decided to post some more in this post and the upcoming posts. 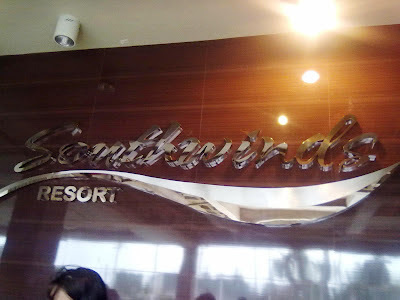 For this entry, I’d like to share a few photos during our trip to a cheap resort in Laguna - Southwinds resort. Let’s start with the resort name signs. One is located by the main entrance. Another is over the receiving desk counter and one more is by the wall on the right side of the open receiving hall. The logo is right in the middle of large images showing the features and amenities located and offered in the resort. But the pictures are not complete without a mini-review of the place. 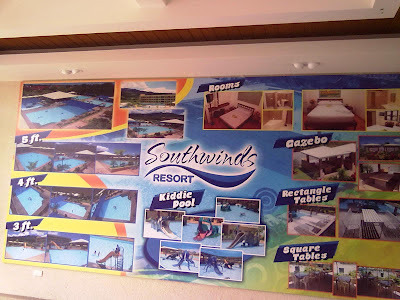 I was at Southwinds Resort courtesy of a free pass from my husband’s team at work for their team building. Since I was at Southwinds resort for free, I didn’t actually bother to check the rates but based on what I’ve checked, the fees are very affordable. In fact, the place can be listed among the list of cheap resorts in Laguna. Among amenities offered by this cheap resort in Laguna, the first thing you’d notice will be the pools. 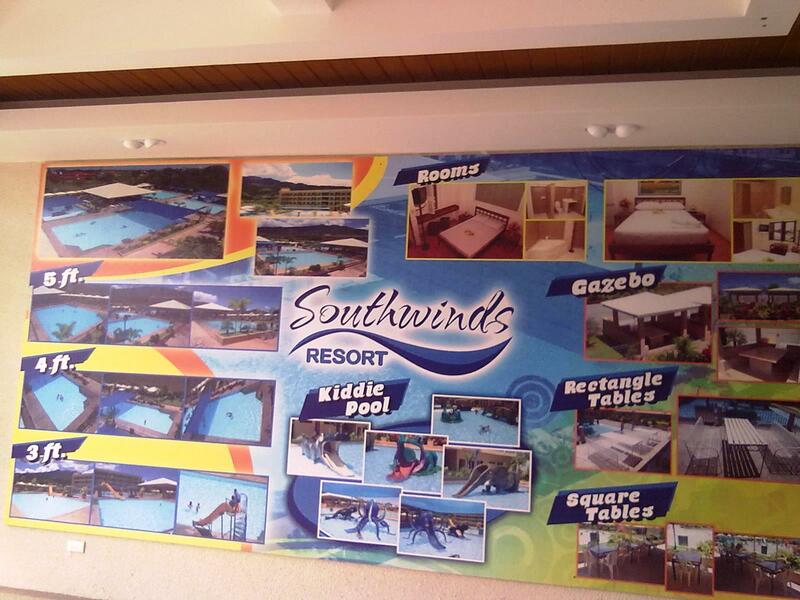 There are four pools available on the Southwinds. These measure 5 ft., 4 ft., and 3 ft. in height. The fourth one is a kiddie pool with larger than life animal and dinosaur slides. An open area is situated right in the middle of the pools. Here, square tables with chairs are placed. There’s also a videoke machine at one side. Another videoke is available at the far left. Sheds with rectangular tables are located on the opposite side (right). Each shed is equipped with a sink for preparing food. A common area is designated for the barbecue grills. As for baths and rest rooms, there are two sets available. They are strategically placed at opposite ends of the resort. Rooms are also offered but we didn’t avail of this amenity as the trip was only for a whole day. 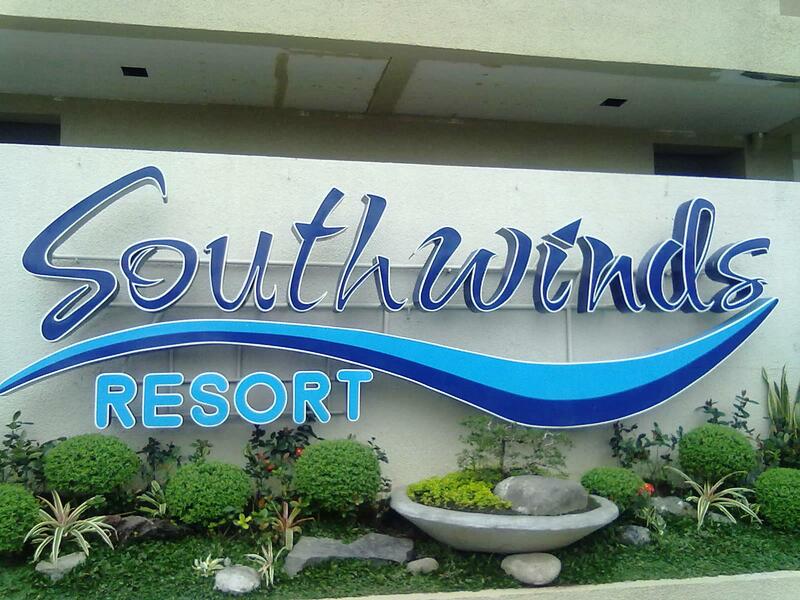 Southwinds may not be the best resort in Laguna but for everyone who would like to experience a refreshing trip away from the buzz and hype of Metro Manila, Southwinds is a recommended resort. The rates are affordable. The amenities are ample enough to serve your needs. The facilities are clean. The staff is hospitable. Plus, a view of the mountains from afar is breathtaking. Pansol is swarming with the best resorts in Laguna. It wasn’t my first time in the town as we’ve been there before for a team building as well but in a private pool resort, which are plenty in the town. Neighboring areas are also offering public and private resorts. So if you’re planning a trip, better start resort hunting over the net or through some acquaintance. It’s best to choose before you head over to Laguna. To get Pansol in Laguna, you have to drive past the far end of SLEX (South Luzon Expressway) and follow the route to Calamba. Turn right at the main intersection. You’ll be greeted immediately by resorts left and right. It’s best to leave early in the morning while the roads are not yet congested with traffic. You can reach Pansol from Alabang (the last Metro Manila expressway stop) in an hour or so. Leave in the afternoon and you’ll find yourself trapped in long lines of vehicles. 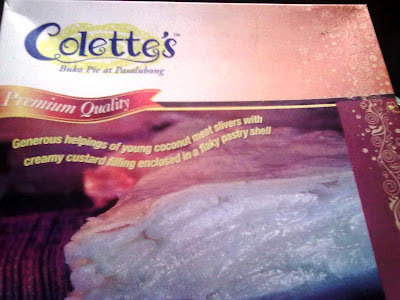 A trip to Pansol, Laguna is never complete without bringing home boxes of Collete’s buko pie. Along the highway alone, you’d pass by 3 or more shops on your out of Pansol. You’d notice that other tourists are also dropping by a Collete’s buko pie shop. If you don’t want to wait in line, you can always buy a pasalubong from other stalls. But Collete’s buko pie is considered the best when it comes to local delicacies. nice place and nice facilities, maybe that's the reason why they didn't know to value their customers. For almost five yrs, we are always recommending the place to our colleagues, families and friends, but after the experience recently with their staff..... id rather stay to other old resorts who knows the worth of their customer. Hello! Will you care to elaborate and share the details? I'm sure other readers can benefit from your experience.